I don’t know what it is about World of Warcraft- with each expansion, i always shoot longing looks in the direction of the genre leader. There’s no need for an expansion- i played World of Warcraft up to level 52 in vanilla times, and that’s the furthest i came along. So WoW offers plenty of content for me without the additional pull of an expansion. So in the last couple of months, i was looking for reasons to buy Legion and didn’t find any. Sure, there are some nice tidbits like the improved transmog interface aka wardrobe, but i can have that in many other MMOs as well. Ultimately, i couldn’t find anything that gave me enough reason to buy into the latest expansion. Until 07/06, that is- when Liore asked if she should buy Legion and i went to read that post in search for an answer for my own ponderings. I didn’t find it in the post, but then Isarii came along in the comments. I just want to grind for hats and mounts, and basically every MMO outside of WoW seems insistent on putting all of those in their cash shop. And this is it. WoW is a themepark, a combat simulator that lacks housing or many non-combat activities. As far as i know, crafting is ‘useless’, too. But if i want to go for a certain look, mount, title or battle pet, i can do that. And while WoW offers mounts in an item store, it’s not much and can be easily ignored. I know Final Fantasy XIV offers the same thing, but as far as i know it isn’t as varied in that game, costumes are for level 50 characters and everything in that game is tied to the main story questline that involves forced grouping. WoW doesn’t force me into anything except if i wanted something specific and it was hidden away behind a certain type of content. Another thing WoW had always going for it was the great zone design- i love how Blizzard crafts the landscapes- plus, it’s an open world for the most part. So, finally finding my reason (read: excuse), i went in again. Of course i started a new character, a human priestess on Argent Dawn (EU). Somewhere, i read that discipline priests will be healing through damage done, which is a playstyle i like pretty much. Argent Dawn is an RP server, and i think its version of Goldshire is famous for its “special kind” of RP. I found it quite annoying, but it doesn’t matter much as Goldshire gets put behind a new character quite quickly. As of right now, i don’t have any plans or goals and i didn’t activate my subscription or buy Legion…yet. But i’m already looking into some guides for returning players, i love the zone design (nothing new here) and i’m having fun right now. 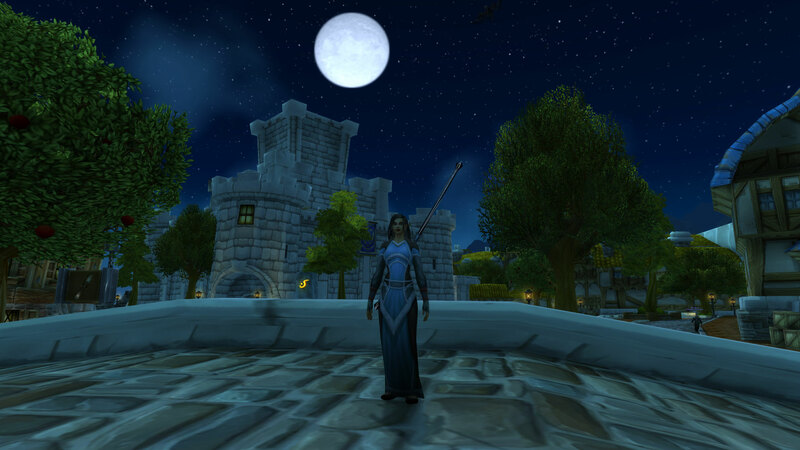 I’m wondering about what transmog outfits would be nice to have, what places to explore and soon i’ll be wondering about which addons to install.